Announcement Welcome in my shop of home decoration in felt, entierely stitched by hand. Welcome in my shop of home decoration in felt, entierely stitched by hand. Item arrived quickly and looks great. It was the perfect ornament for my soccer playing cat lover :-). Très mignon. Tel que la photo présentée. Petit ensemble assorti : porte-monnaie et broche chat gris ! Little matching set : grey cat coin purse and brooch ! Indispensable pour ranger l'argent de poche de votre enfant ! Essential for storing your child's pocket money ! Porte-clef cheval-arc pour tous les fans d'equitation et tir à l'arc ! Horse archery keychain for every riding and archery lovers ! My ornaments are carefully packed up, ready to be given or open by yourselves. I try to propose differents hanging ornaments to give to people you love. I always have a lot of ideas but unfortunately not the time to realize them all. I try to always have a lot of colors to propose. I sew all my ornaments in my living room, surrounded by my homeschooled children. After I realized a lot of felt ornaments for my 4 children, I started stitching for my close family and my friends for their birthdays, mother's day, father's day, and Christmas. I put pictures on my Facebook profile. As everybody asked me, I opened a Facebook page "I believe I can fil" and I started an Etsy shop. I hope my ornaments will please you. I stitch all by hand, never using glu, nor sewing machine, and I embroider all the details. I was passionated by stitching little decorative items in felt for my 4 children or my friends. Everybody encouraged me to open an Etsy shop, so I did ! Titulaire d'un doctorat de chimie qui ne m'a jamais servi, j'ai appris le commerce en gérant une boutique de lingerie et une boutique de vêtements en coton biologique, en vendant sur les marchés et sur internet. Et un jour, je me suis mise à coudre. Welcome in my home decoration shop. 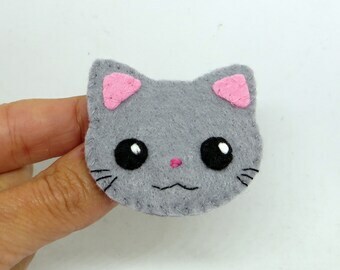 My items are entierely handmade in felt. I don't use sewing machine or glue. When you receive your order, if something went wrong, thanks to send me an email to try to fix the problem. I accept credit card payments via direct payment on Etsy and paypal. I accept French check only. All prices are in Euros, shipping not included. Delivery is made by French Post. For the little decorative items, delivery is followed letters in France and prioritary international followed letters for the rest of the world. For the pillows, delivery is in Collissimo for France and French overseas territories, and in little international followed packets for the rest of the world. Shipping costs are fixed for one or more articles, you pay the same price. I can realize the item you dream of, contact me to discuss it.